Our vision is to establish a world-class limb lengthening and reconstruction program at BC Children’s Hospital (BCCH) in order to treat children with limb deformity with the best level of care available. We aim to maximize patient engagement to identify and address their needs and actively involve them as research partners. Our aim is to work directly with patients and families to answer clinical and research questions that matter to patients. Paediatric limb deformity represents a wide spectrum of devastating disorders affecting children. These include birth defects, the complications of severe infection in infancy and the late effects of trauma. 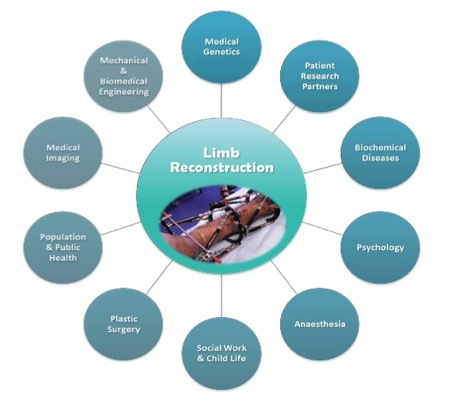 Our multidisciplinary research program involves studies on quality of life, clinical outcomes, complications of limb reconstruction, and imaging in these patients. BC Children’s Hospital is the highest volume pediatric limb deformity centre in Canada. We have been able to successfully create a multidisciplinary research program involving collaborations with Medical Genetics, Biochemical Diseases, Mechanical Engineering, Biomedical Engineering, Anaesthesia, Plastic Surgery, Medical Imaging, Bone Biology, Psychology, and Population and Public Health at hospitals and universities across Australia, Canada, Ethiopia, India, Netherlands, UK, and USA. 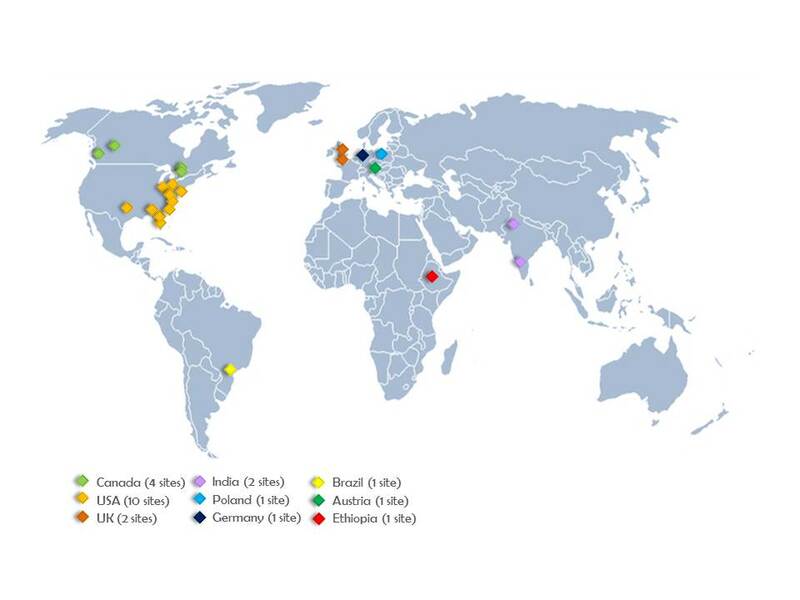 Our program has ongoing collaborations with various hospitals and universities across Australia, Canada, Ethiopia, India, Netherlands, UK, and USA. The international collaborations built through our program will not only influence clinical and research practices at each of the participating institutes but also catalyze new partnerships and contribute to BCCH’s status as a centre for clinical and research excellence. Through this study we are investigating the impact of having a lower limb deformity on the QOL of children and adolescents. With our existing international collaborations, we were able to interview the children and families at various institutes in Canada, Ethiopia, India and USA and gain first-hand knowledge about the impact of having a lower limb deformity on the QOL of children. The international multicentre approach for this project has put us in a unique position to compare and contrast the differences/similarities in the QOL of children from various high income and lower - middle-income countries. This study looks at elbow fractures, which one of the most common fractures sustained following a fall on an outstretched hand among healthy children. This study involves interviewing children with elbow fractures and obtaininging measurements of the play structure involved in the injury. These measurements when compared to the standards issued for children’s play spaces and equipment by the Canadian Standards Association (CSA) will have implications for the child safety and injury prevention. Our limb deformity database, which has over 200 patients to date, allows us to prospectively record outcomes of various treatment procedures for children with limb deformities. This study will enable us to compare time in corrective frames, number of surgeries, and complications and help us determine any changes required in our ongoing clinical care based. This study investigates the Pin Site Infections, which is one of the most common complications of using an external fixator device. This is the largest collaboration of its kind with 14-limb reconstruction surgeons involved from various sites across Canada, USA and UK with BCCH as the leading site. We are the primary leading site for an international registry for CPT, a rare orthopaedic condition. This multicentre registry will prospectively collect data from patients with CPT at various participating centres across the world. Morquio B Disease (MBD) is a rare genetic disorder with less than 50 patients known worldwide. Together with international experts in MBD and patient partners, Dr. Sylvia Stockler (Head Division Biochemical Diseases, BCCH) and Dr. Cooper (Pediatric Limb Reconstruction surgeon) are conducting a prospective observational natural history study to determine measurable outcomes for the anticipated clinical trial of small chaperone molecule as a potential causative treatment for patients with MBD. using a multimodal anaesthesia approach. We have initiated a novel study to investigate the utility of standing MRI scans of hips affected by LCPD in children. The Centre for Hip Health and Mobility has the only research-dedicated upright MRI scanner of its kind in the world. The preliminary findings demonstrate the feasibility of upright MRI scanning and may reveal previously undetected hip deformities. Along with the Departments of Medical Genetics and Biochemical Diseases, we are investigating the genetic causes of some rare orthopaedic problems. This work involves Next generation sequencing, which allows a person’s genes or entire genome to be read and analyzed within a few days. NGS allows the discovery of disease-causing genes with a relatively small number of patients. The aim of this project is to support the families in the orthopaedic clinic waiting room and investigate the reason for long wait times. Long wait times have been shown to be a significant source of anxiety and unhappiness in families receiving care at the orthopaedic clinic at BC Children’s Hospital.